TRUGLO Omnia rifle scopes would make a powerful enhancement to any SWAT or Patrol rifle. TRUGLO has released their new Omnia AR-Rifle scopes designed specifically for the AR-15, also known as the Modern Sporting Rifle (MSR). The Omnia rifle scope series offers both a 1-4x and 1-6x scope, and we’ll discuss the benefits and considerations for using both of these designs. TRUGLO packs a lot of features into the Omnia scopes, while keeping their overall price reasonable, making these scopes serious contenders in their respective magnification fields. We’re always excited to see new optics come to market, and the TRUGLO Omnia scopes have definitely caught our eye! TRUGLO started as a fiber optic sight manufacturer in the archery field. Their fiber optic pins for modern compound bows provided archery hunters bright aiming points in lower-light conditions, and were widely praised among hunters. I have a TRUGLO 5-pin sight on my BEAR bow, and it has been fantastic. Not long after their archery successes, TRUGLO entered the pistol sight market. Once again, their fiber optic sights have been praised by shooters as providing a great aiming system in lower-light and daylight situations, and typically at prices below most night sights. Now TRUGLO is starting to complete their sighting options with a series of rifle scopes and optics. The Omnia scopes are quality contenders for CQB and mid-range shooting. The ZAK Tool ZT-14 is my preferred handcuff key. Handcuffs have been around for hundreds of years, and are still one of the most widely used restraints for prisoners and suspects of criminal activity. In the 20th century handcuffs began to develop into more uniform design, appearance, and function. This led to manufacturers developing more universal handcuff keys and locking systems. The ZAK Tool ZT14 is a modern handcuff key designed to meet several operational needs of police officers. This review will highlight the benefits of selecting the ZAK Tool ZT14 handcuff key, as well as a comparison with several competitor models. BlueSheepdog is dedicated to bringing our readers excellent law enforcement training, critical incident reviews, and product reviews of key gear and equipment to help them deliver the best service they can to their communities. This product review is aimed at highlighting the qualities of the Zak Tool ZT14 handcuff key, and why the author has selected this particular handcuff key for everyday carry on-duty. EDITOR’S NOTE: BlueSheepdog does not sell advertising or perform paid reviews. This allows us to provide our readers the most independent and honest reviews we can. The Zak Tool ZT-14 handcuff key from this article was purchased just like any customer. BlueSheepdog does participate in the Amazon Affiliates program. This program pays us a small percentage from any sale from the embedded links in our articles, while not raising your price. These payments literally pay to keep this site operational, and we greatly appreciate your patronage. The Browning Pandemonium has a unique Tanto blade and nice G10 grips. The Browning Black Label Pandemonium fixed blade knife is just one of several Browning Black Label knives have received many favorable reviews for their designs, materials, and practical uses particularly in “tactical” settings. In fact the Browning Pandemonium is one of the Black Label “Tactical Blades” series knives, and we can definitely see the influence of international martial arts expert Jared Wihongi on this one. Browning has been making knives for several decades now, but it wasn’t until a few years ago they switched gears a little bit and began producing more “tactical” minded knives. Previous knife offerings were the more traditional pocket knife or hunting knife variety, but the Black Label knives are definitely a departure into realm of professional use. Browning took the effort to enlist the expertise and design advise of professional knife fighters and martial artists to ensure their Black Label knives live up to their professional claims. The Black Label Pandemonium has a lot of potential. EDITOR’S NOTE: BlueSheepdog does not sell advertising or conduct paid reviews. This allows us to provide our readers the most independent and honest reviews we can. The Browning Black Label Tactical Blades Pandemonium from this article was purchased just like any customer. BlueSheepdog does participate in the Amazon Affiliates program. This program pays us a small percentage from any sale from the embedded links in our articles, while not raising your price. These payments literally pay to keep this site operational, and your patronage is appreciated. The Z-Rex is a compact purpose-built multi-tool that every First Responder should have. The Leatherman Z-Rex Multi-Tool is the perfect companion to today’s First Responder. Designed by Leatherman to tackle the most immediate needs of First Responders dealing with locked vehicles or trapped occupants, the Z-Rex multi-tool should be in every police officer’s go-bag or car, and on every Fire truck and ambulance. Having over 21 years on the job, and nearly 60 years combined service from the BlueSheepdog Crew, I know just how precious space is on a duty belt or duty/go-bag. However, after carrying the Leatherman Z-Rex Multi-Tool for over three months I am very glad I made this purchase, and it will become a trusty companion well beyond my career. Leatherman is much more famous for delivering some of the highest quality multi-tools designed for the every-day or professional working man and woman. These tools typically are built around a set of quality pliers, and then include a litany of accessory tools like knives, screw drivers, and even small wrenches. However, in recent years Leatherman seems to be dialing in the focus of some of their tools to be much more task-specific. What I mean here is, Leatherman seems to be designing tools for specific jobs or professions, rather than a catch-all tool that can cover a plethora of tasks. EDITOR’S NOTE: BlueSheepdog does not sell advertising or conduct paid reviews. This allows us to provide our readers the most independent and honest reviews we can. The Leatherman Z-Rex from this article was purchased just like any customer. BlueSheepdog does participate in the Amazon Affiliates program. This program pays us a small percentage from any sale from the embedded links in our articles, while not raising your price. These payments literally pay to keep this site operational. The Strike Industries Glock Grip Plug Tool is a great addition and handy tool. The Strike Industries Grip Plug Tool for Glock handguns is an ingenious, multi-purpose, tool designed to plug the open area between the bottom of the pistol grip and the back side of the magazine well. Unlike similar products on the market, however, the Strike Industries Grip Plug Tool goes much further than just a plug for this open space. The Grip Plug Tool is creatively designed to maximize the space by including a Glock pin punch tool, a flathead screwdriver, a small gun lubrication storage reservoir, and even acts as a helpful magazine ramp during loading. 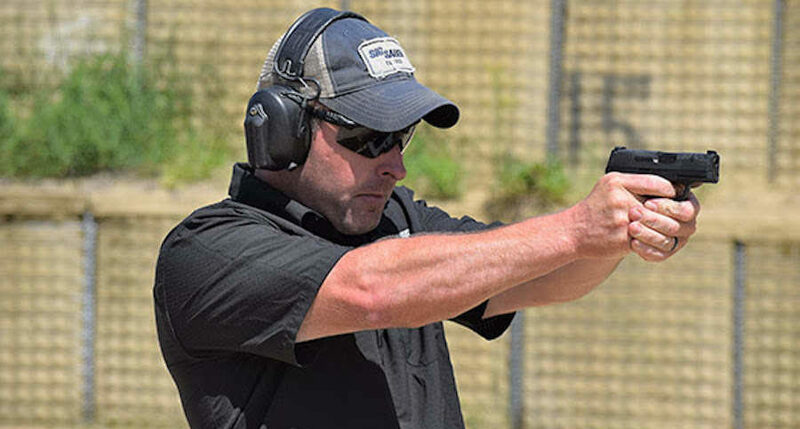 This provides shooters with all the critical tools necessary to conduct field maintenance on the Glock, while plugging the annoying open space of the grip. The Strike Industries Grip Plug Tool is tailor-made to fit into this crevice, and lock into place by use of a tension lock fitting into the lanyard hole on the Glock grip. This open area is one of the few universally recognized annoying features about Glock pistols. When Gaston Glock originally designed the Glock 17 I’m sure he believed leaving this area open would not be problematic to users. In fact, leaving this area open does reduce weight and unnecessary bulk. However, anyone who carries a Glock handgun for any length of time knows this open area becomes a repository of dirt, dust, lint, and anything else that can find its way into the crevice.